In agriculture, getting the job done can mean working the whole day, every day. That means having equipment that works just as hard. The new Case IH Farmall® C Series tractors are more than ready to do their part. Built to reliably and cost-effectively deliver the power and performance utility tractor owners need, the new Farmall C tractors also meet the demand for greater operator comfort during increasingly longer days. "When it comes to performance, the Farmall has a hardworking heritage that goes back to 1923, and the new Farmall C Series builds on this tradition while offering best-in-class operator comfort and ergonomics, as well as features designed to further enhance productivity," says Greg Lucey, Case IH marketing manager for Farmall tractors. "If you're looking for a utility tractor that can do it all, you'll be impressed with these three new models. There an ideal fit for farms, feedlots, municipalities and more." When you're depending on your utility tractor to work as hard as you do, you need to know the engine, at its heart, is a proven performer. That's why Case IH Farmall C Series tractors all feature the FPT Case IH 4-cylinder, 3.2-L engine. It's a rugged, dependable design that offers fuel-efficient performance along with an untarnished service record. For all models, the engine is turbocharged - and the Farmall 85C and 95C engines are also intercooled. You can get versatile performance from a utility tractor without sacrificing value. The new Farmall C Series tractors are the proof with standard features that some competitors only offer as expensive add-ons. Farmall C tractors feature separate steering and implement hydraulic reservoirs, so if you're lifting a heavy load, you don't have to sacrifice the ability to steer and maneuver. The open center hydraulic system, one standard remote valve and three-point hitch - featuring flexible lift arms and telescopic stabilizers - make the tractors capable of handling nearly any implement. Your ability to put in long, productive hours is only as good as your work environment. 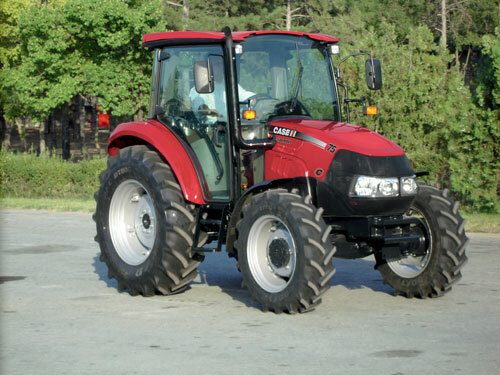 The ideal tractor cab helps both operator and machine work to their optimum capacity. The Farmall C Series features a new, quieter, best-in-class cab design that promises to provide outstanding operator comfort along with greater ease of operation. The new optional high-visibility roof window panel, which can be opened, improves visibility, productivity, and safety during loader operations. Ergonomics also play a key role in the new cab design, with controls designed for easy operation. For optimum comfort and enjoyment, the Farmall C series tractors can have a factory-installed radio with iPod connection and has a larger driver's seat with an optional 15° pivot to reduce neck strain when monitoring rear implements. Reduced noise levels will help ease operator fatigue, further increasing productivity. Another available option is an instructional seat for greater convenience and safety when training new operators. "These tractors will set the standard of excellence for tractors in their class for years to come with their power, versatility, and ease of use," says Lucey. "They combine all of the best features with nearly 90 years of Farmall tradition to create a tractor you can use all day, and still want to come back for more."